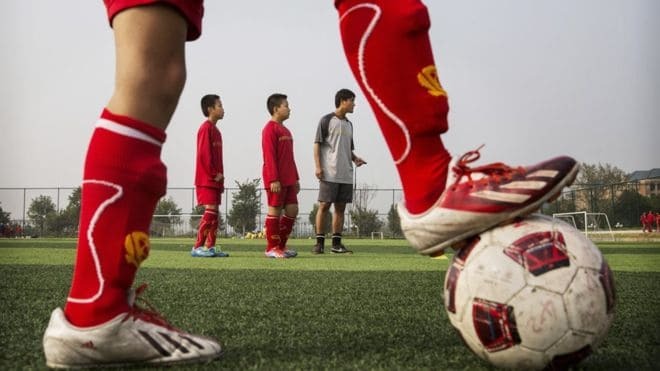 In the biggest ever study of its kind, carried out by Coventry University’s Centre for the International Business of Sport (CIBS), nearly 16,000 football fans from across China were surveyed online via one of the country’s most popular social media sites, and were asked to identify their favorite teams at club and national level, as well as their favorite league. The survey was undertaken between September and November 2013, drawing a total of 15,586 responses via China’s popular Sina Weibo micro blogging platform, and whereas previous research of this nature has tended to focus solely on clubs, in this study we explored national team and league fandom too. Here you can read more about football data analytics for the Italian experience. Arsenal edges Manchester United to top the list of most popular clubs amongst fans, the Gunners being selected by 3,785 respondents to United’s 3,210. AC Milan are the third most popular club in China (with 2,204 respondents) followed by Real Madrid (1,959 respondents) and Barcelona (1,930). Germany comes out top of the national team favorites (3,118), followed by Italy (2,488) and Spain (2,418). Despite having the two most popular clubs, England is only the fourth most popular national team with 2,393 respondents. China’s favorite South American national teams are Argentina (1,372) and Brazil (1,120). The English Premier League is overwhelmingly the favorite national division among the Chinese fans, coming in way ahead of its nearest global rivals with 7,697 respondents (almost 50 per cent). Spain’s La Liga is second (3,910 respondents) and Italy’s Serie A ranks in third place (3,614). Germany’s Bundesliga, however, appears to have some way to go to win the hearts of Chinese fans, receiving 318 votes by respondents. Fans are more likely to support a club team when players from their favorite national squad regularly make the starting line-up. This means players like Mesut Özil and Lukas Podalski, both German international players and players for the English Premier League’s Arsenal, are likely to fulfill an important commercial and marketing role for club, country and league. We report several new and significant observations, for instance ‘sense of pride’ is an important variable in national team support. Nearly 11,000 respondents identify this as being an important component of their fandom, and over 11,000 fans stressed that they are die-hard supporters of their current favorite national team. The importance to Chinese fans of being able to identify, engage and communicate with other fans who share their team and league preference is also apparent – nearly 13,000 respondents identified social media as being an important way of bringing fans together. A sense of fraternity is clearly very important to Chinese fans, and the rapid growth of social media enables them to gather together and discuss all aspects of ‘their’ team or league. The study, which makes a significant contribution to understanding football fandom in China and China as a country, is part of an ongoing CIBS research project examining the preferences and behaviors of overseas football fans. Other countries in which this research has been undertaken include South Korea, Japan, and the United States.